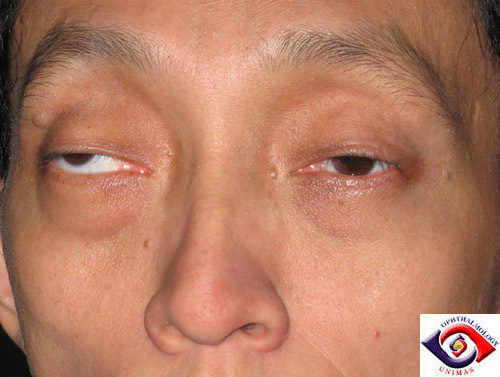 A 47 year-old man was referred to our eye department for a 20 year-history of progressive worsening bilateral ptosis and a right exo- and hypertropia (Figure 1). His Tensilon test several years ago by a neurologist was normal. He also saw a cardiologist but found to have no cardiac abnormalities including any conduction defect. He did not have muscle biopsy but based on the clinical signs and history he was diagnosed as chronic progressive external ophthalmoplegia. The ophthalmologist whom he attended regularly was unwilling to perform ptosis operation for fear of exposure keratitis as his Bell's phenomenon was poor. On examination, the vision in each eye was normal at 6/6 with glasses. The ptosis were severe and covered the pupillary axes and he needed to elevate his head constantly to see clearly. The levator function was less than 2mm (Figure 2). The ocular movement was poor in all directions (Figure 3). The Bell's phenomenon was absent in both eyes but the corneal sensation was intact (Figure 4). Figure 1. 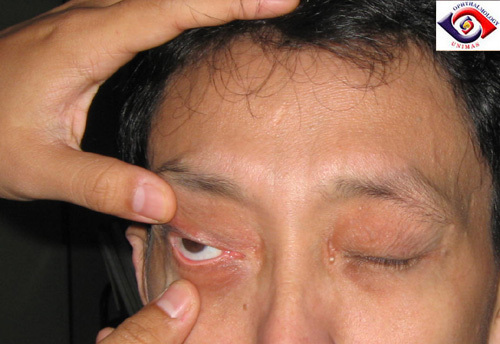 Severe ptosis (note the absent corneal reflexes) and right ocular deviation. Figure 2. Poor levator function from downgaze to upgaze. Figure 3. Poor ocular movement on attempting to look in either direction. Figure 4. Poor Bell's phenomenon. a. A frontalis suspension was chosen to elevate his eyelids using the techniques mention in case 34. How would the procedure in this patient differs from that of others without chronic progressive external ophthalmoplegia? He underwent bilateral frontalis suspension using 2/0 prolene. Post-operatively, he had reduced blinking and problems with complete eyelid closure at sleep. Despite regularly topical artificial tear and chloramphenicol ointment at night, he developed bilateral exposure keratitis 3 days post-operative with epithelial defects which was worse in the right eye than the left. He asked to have the prolene removed so that he was able to close his eyes better. at sleep and the corneas were exposed. b. What are the options for managing his corneal problems while waiting for his eye closure to improve spontaneously ?